I recently finished watching the latest season of Better Call Saul, the prequel to Breaking Bad. Personally, I think it’s one of the best–if not the best–drama on TV right now. The characters are interesting, the plot keeps me guessing, it’s funny at the right times, and I love watching a good, fictional con. Plus, without spoiling anything, I like seeing how different people grow their businesses in unique ways. Better Call Saul has several such plotlines. I liked Breaking Bad for many of those same reasons, but I enjoy Better Call Saul more because I’ve found it easier to root for the main character. He’s a good guy who does some bad things, while Walter White was a bad guy with some good intentions. Both are fascinating characters, of course. 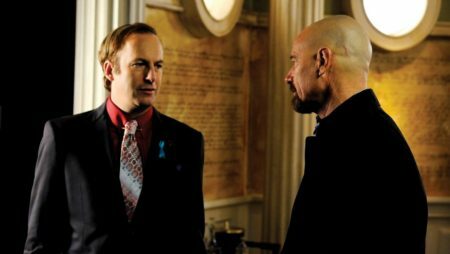 One thing that has occurred to me while watching Better Call Saul is that it seems like it stands alone–that is, it doesn’t need Breaking Bad to be good. But there are a number of major plotlines that lead up to significant elements of Breaking Bad. So here’s my question: Does anyone watch Better Call Saul who didn’t watch Breaking Bad? If so, does it still make sense to you? I’m not sure I would understand what’s going on or why it’s meaningful if I hadn’t already watched Breaking Bad, so I’m curious about your perspective. Also, if you’ve watched both shows, which do you enjoy more? Last, fun fact: The creator of Breaking Bad lived about three houses down the street from me when I was growing up. I didn’t realize this until my parents told me a few months ago. This entry was posted on Thursday, November 15th, 2018 at 8:54 pm	and is filed under television and tagged with television. You can follow any responses to this entry through the RSS 2.0 feed. On balance I preferred breaking bad. I think the latest season on Saul was very much a prequel as it starts to directly address why certain things are the way they are in Breaking Bad. I preferred the previous seasons, the realtionship between Saul and his brother was fascinating and really made this a great standalone show I think anyone could be compelled by.